From time to time I invite other food writers to share something from their kitchen with you. 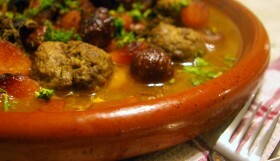 Often the post will highlight a recipe that I have needed guidance on or a dish I have never cooked myself. Today’s recipe is from a foodie friend of mine, Hindy who writes at Confident Cook, Hesitant Baker. Like Hindy, I hesitate to bake but love to experiment in the kitchen and develop new recipes and had it not been for Hindy, I would never have expanded my culinary repertoire to include millet after the first time she guest posted with vegetable millet pilaf. Fresh tuna is a delicacy in our home usually reserved for sushi night because I have a horrible tendency of overcooking the fish. Overcooked, grey and chewy tuna is a waste of good fish and a waste of money so I am pleased Hindy is sharing her recipe here today. 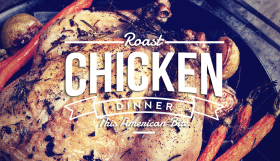 Thanks to Yosef for inviting me over for a guest post. I always find Yosef’s recipes so inspiring. I love that we have a similar taste in food – both choosing to cook with quality ingredients – leading to wonderful whole foods for our family and friends. 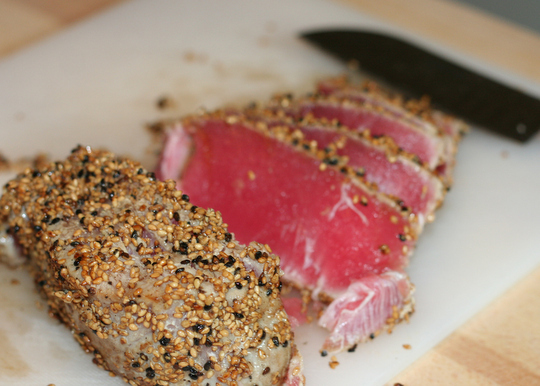 I’ve been meaning to make seared tuna for a long time. Every time I head in to my local fish market, I check to see if they have a nice piece of fresh tuna available. 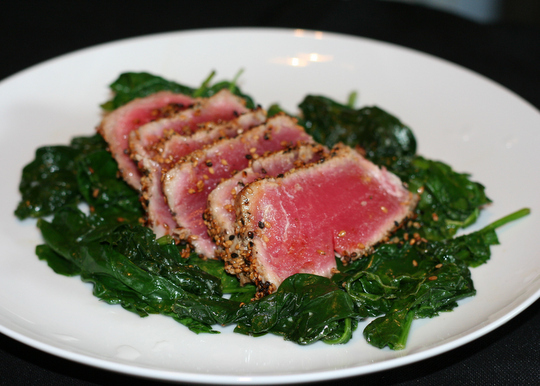 My dad once made a fantastic piece of sesame seared tuna and ever since, I’ve wanted to recreate this dish at home. It finally happened. I wandered in to the fish market and I saw the piece of tuna. This wild caught tuna looked perfect. I asked the shopkeeper to cut it to my specifications and I was on my way. I had everything else at home! Dinner was on its way. With tuna, it’s important not to overcook it. 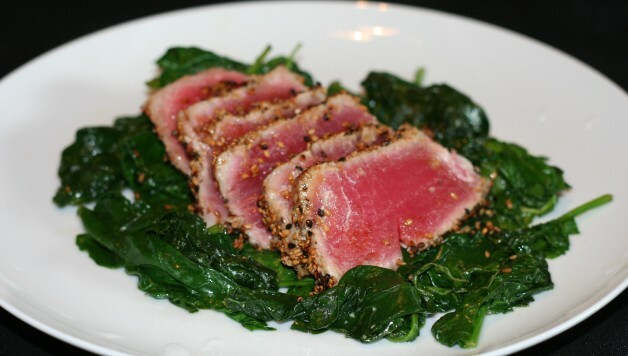 If you overcook tuna, it becomes grey and hard to chew. I prefer my tuna raw, in sushi, but I also love it lightly seared. For my family members that prefer it more cooked, so I sear it a few minutes longer for them. Everyone is happy. 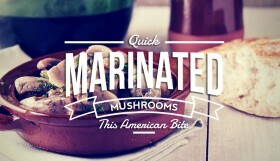 Mix up the marinade ingredients and marinate for the tuna for around 20 minutes. 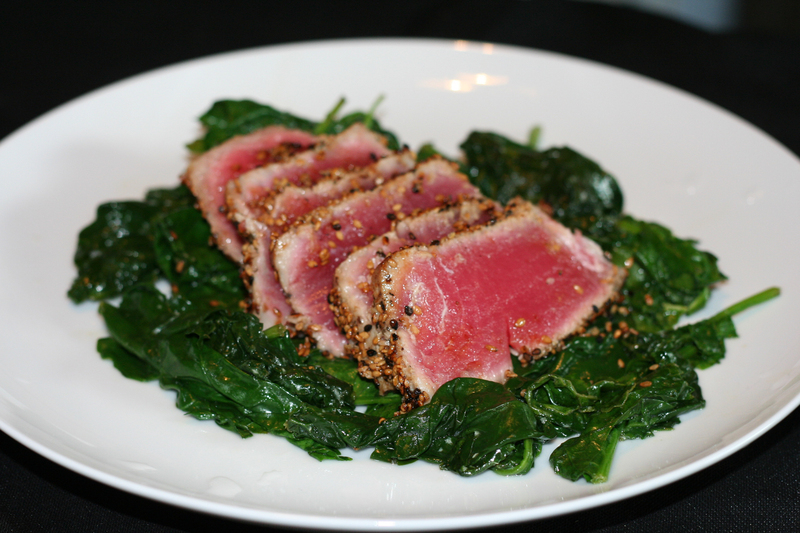 You want the tuna to be room temperature when you sear it. 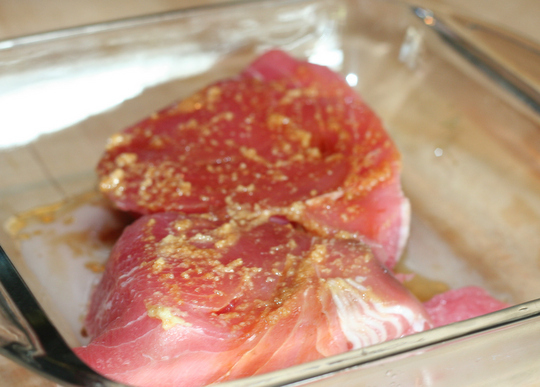 Remove the tuna from the marinade and pat dry with a paper towel. 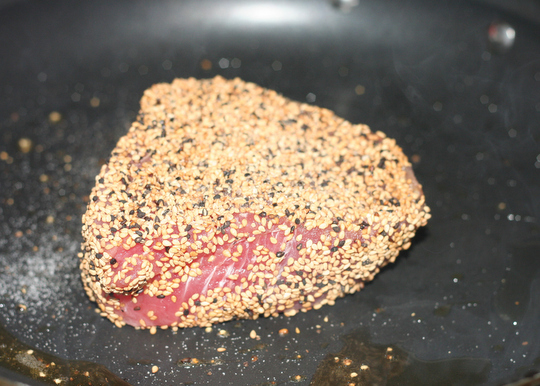 Place the sesame seeds, salt and pepper on a plate. 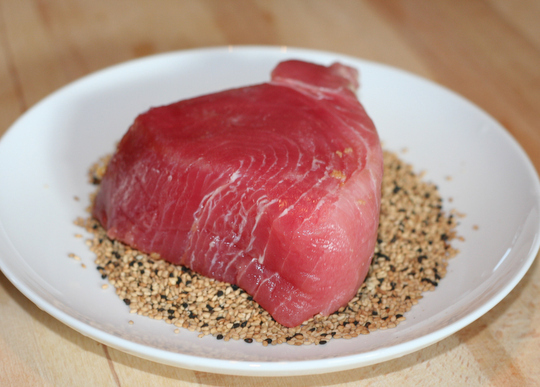 Coat the tuna in the sesame seed mixture. 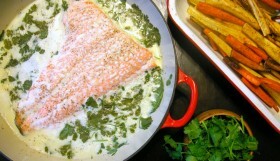 Heat up a large pan until very hot. Add the oil. Sear the tuna in the pan for 1-2 minutes per side. You should sear it in all sides, including the sides. Sear it to whatever rareness you desire. I prefer about 2 minutes per side. When done, move to cutting board. Let it rest for a minute. Slice the tuna thinly and serve with some rice and fresh veggies. Enjoy!